If you currently own or have owned a dealership, you know the requirements for purchasing a new dealership and we don't need to tell you what they are. If this is your first dealership purchase, there are several things you should know and if you wish to call us we can go into more details for you. The first two requirements from any manufacturer or distributor are money and experience. You or someone on your team will have to have these two essentials. The amount of money will depend on the size of the dealership, leasing or buying the real estate, etc. You will need at least 25 to 30 percent of the total acquisition costs in liquid, unencumbered assets. Most factories or distributors want someone who will be on the dealership agreement to have at least three years experience as a general manager or general sales manager at a dealership that is profitable and has a good CSI rating. Also, you will be subject to a very thorough financial and background review. Buying an automobile dealership is not easy but the rewards can be tremendous. 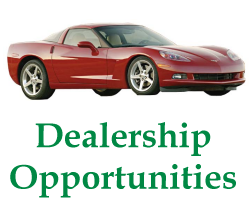 Call us whether you are an experienced buyer or this is your first dealership. We can make either very satisfactory to you the client.